Bra'tac arrives at the SGC with disturbing news. 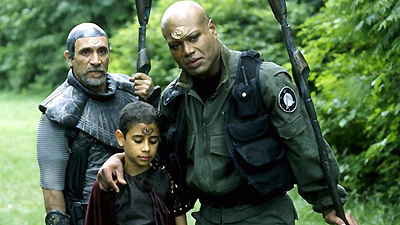 Apophis has survived and kidnapped Teal'c's son Rya'c. SG-1 returns to Chulak to rescue Rya'c, but there they find that much has changed. Teal'c's wife, Drey'auc, has married his old friend Fro'tak, and Rya'c, now brainwashed, has denounced his father as a traitor. Attempts at a rescue are further complicated by Fro'tak's betrayal, and suspicion that Rya'c may be part of an elaborate trap. In fact, Rya'c is hiding a powerful virus that could destroy Earth. But even after averting this crisis, Rya'c's brainwashing must still be reversed. Bra'tac has an SG-1 remote transmitter and code, to be used in an emergency. Apophis and Klorel escaped through the onboard stargate before their ships exploded. Nearly all their loyal serpent guards were killed, and Apophis returned to Chulak shamed and weakened. He must reinstate his power or the System Lords will send another to rule in his place. Fro'tak of the High Cliffs was one of Teal'c's oldest friends since they were both wards of Bra'tac in the bashaak training. He has high station and works in the west wing of the palace in the hall of recording. When it appeared Teal'c would not return, Drey'ac had her marriage removed, and married Fro'tak. Drey'ac is of the Cord'ai Plains. Rya'c described her of the Morning Cham'ka Groves as a hidden message. Kel Mar Tokeem: Jaffa term meaning "revenge by the wearer of horns", a reference to being a cuckold. Rya'c had lost two teeth when training with Master Bra'tac. They were replaced with hollow teeth each containing a different biological organism. The organisms are dormant until combined, when they would multiply exponentially, release into the atmosphere, taking two days to spread across North America, less than a week to spread around the world, and killing every living thing within 24 hours of contact. ECT, or electro convulsive therapy, is similar to a zat'nik'tel discharge and effective in deprogramming. Drey'auc and Rya'c will live in the Land of Light.